The technique of velveting — accomplished by briefly marinating bite-size pieces of meat or fish in egg white, cornstarch, and a little water or rice wine — is most impressive when applied to chicken breast. 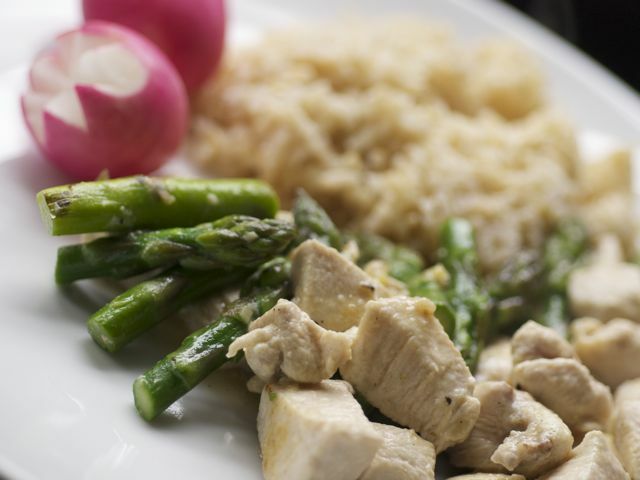 This is one of the most refined stir-fries: the chicken breast is silky smooth, with extraordinary succulence, and the asparagus is crisp-tender. In a 2-quart saucepan, bring the 1 quart water to a boil over high heat. Add the asparagus and cook, stirring, for 1 minute, or until the asparagus is bright green and the water has almost returned to a boil. Use a skimmer to transfer the asparagus to a colander, reserving the pot of water. Shake well to remove excess water. Transfer the asparagus to a bowl. In a medium bowl, combine the chicken, egg white, 1 tablespoon of the cornstarch, 2 teaspoons of the rice wine, and ¾ teaspoon of the salt. Stir until the cornstarch is totally dissolved and no clumps are visible. Add 1 tablespoon of the oil and stir to combine. Put the chicken, uncovered, in the refrigerator for 30 minutes. In a small bowl, combine the broth, white pepper, and the remaining 1 tablespoon rice wine and ¼ teaspoon cornstarch. Return the water to a boil over high heat. Add 1 tablespoon of the oil to the boiling water. Reduce the heat to low. When the water is barely simmering, carefully add the chicken, gently stirring it so that the pieces do not clump together. Cook 1 minute, or until the chicken just turns opaque but is not cooked through. Carefully drain the chicken in a colander, shaking the colander to remove any excess water. Heat a 14-inch flat-bottomed wok or 12-inch skillet over high heat until a bead of water vaporizes within 1 to 2 seconds of contact. Swirl the remaining 1 tablespoon oil into the wok, add the ginger and garlic, then, using a metal spatula, stir-fry 10 seconds or until the aromatics are fragrant. Add the asparagus, sprinkle on the remaining ¼ teaspoon salt, and stir-fry 30 seconds or until the asparagus is almost crisp-tender. Add the chicken. Restir the broth mixture, swirl it into the wok and stir-fry 30 seconds to 1 minute or until the chicken is just cooked through and the sauce lightly coats the chicken.